Mountainrunner asks for 60 seconds of your time. What are your thoughts on Robots and War? Findings are expected to be as they are expected to be. If the results of my previous experiment are any guide, what I will actually find is something entirely different. Rational behavior in the ultimatum game, which is the basic of the wary guerrilla categorization, can be taught. Either prior knowledge (Lusk & Hudson, 2004), repeated tries (Slonim & Roth, 1998) or group deliberation (Robert & Carnevale, 1997) results in more rational behavior. 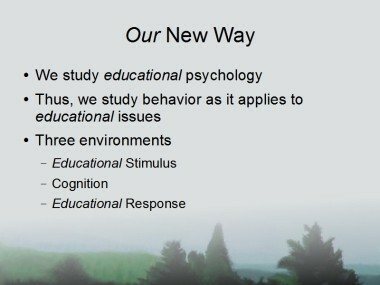 It would be interesting and useful to see if similarly â€œrationalâ€ group behavior can be taught. Tuovinen & Paas (2004) give a quantitative description of teaching efficiency that could show how cognitive load interferes with learning correct decision-making strategies. 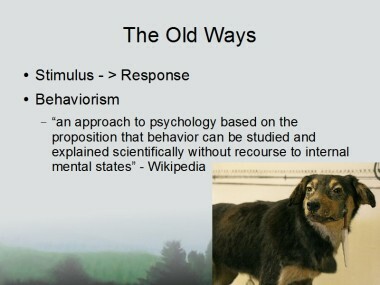 Likewise, research that shows that self-explanations improve understanding (Chi, de Leeuw, Chiu, & LaVancher, 1994; de Leeuew & Chi, 2003) may be combined with research on rational and moral development (for example, Moshman, 2005) and how technology can be used to increase critical thinking (Dempsey, PytlikZillig, & Bruning, 2005). 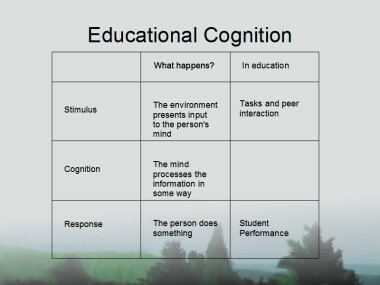 Similarly, dynamic task selection allows training to vary by cognitive ability of the learner (Salden, et al., 2004). One could apply cognitive load training to group work and the wary guerrilla game, and discover the best way to train students to interact with one another. This could be combined with variations of the ultimatum game, such as where a third player is absolutely helpless (Oppewal & Tougareva, 1992) or the participant should shrink the size of the pie while still accepting (Andreoni, Castillo, & Petrie, 2003). Besides being intellectually interesting in themselves, these twists provide room for developing ultimatum game expertise within the time constraints of running of an experiment on volunteer undergraduates. Another question to be asked is how technology can be altered to increase a sense of community. Community-building is a recommended feature of online courses (Horn, PytlikZillig, Bruning, & Kauffman, 2003), and public goods contribution has been found to be positively impacted by video (Kurzban, 2001) and possibly increased by pictorial (Fulwider & Saferstein, 2007) representations. A resource allowing the testing of pictorial representations is readily available at no charge (Minear & Park, 2004), and could easily be added to the experimental design. The author is at an institution which has studied computer-mediated v. face-to-face interaction via commonly used educational software (PytlikZillig, Bruning, Horn, & Bodvarsson, 2005), thus such a study would fit well into the current research. In The Wary Guerrilla‘s original research on the wary guerrilla, the subject of cultural variability was brought up. Cognitive load effects social behavior in different groups differently, apparently because levels of social automaticity vary by culture (Knowles, Morris, Chiu, & Hong, 2001). Further experimentation has only emphasized the need for such a study. Either work in a foreign country, or with international students at a local university, would be insightful. 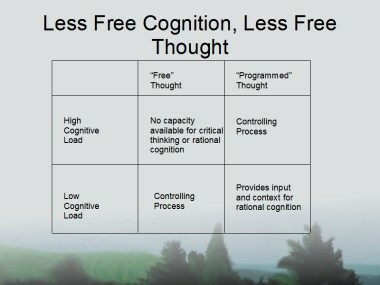 This post will began by describing Cognitive Load, and continue by refreshing the viewr on Cooperative Behavior (previously discussed in The Wary Guerrilla). 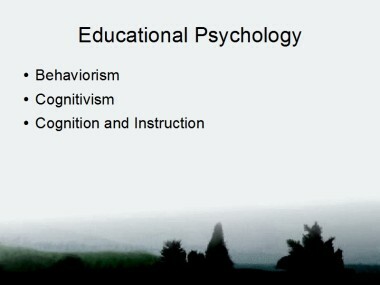 Last, today’s contribution will discuss how these concepts work in the mind and, more important, in the classroom. Cognitive load is composed of the the â€œthe number and nature of component skills involved.. and the complexity of the goal hierarchyâ€ (Paas & van Merrienboer, 1994, 355). Two aspects of cognitive load are the the split-attention effect (where information is physically separated on a page) and redundancy effect (where information is repeated in different media) (Kalyuga, Chandler, & Sweller, 2000). While discovered in their contemporary form in the 1980s and 1990s (Sweller & Chandler, 1991), they have been observed for generations (Miller, 1937; Sonneschein, 1982 Sweller & Chandler, 1994) across many domains of knowledge (Mwangi & Sweller, 1998). This study rejects the notion, found in some academic literature (Dixon, 1991; Goldman, 1991), that cognitive load theory is impractical. 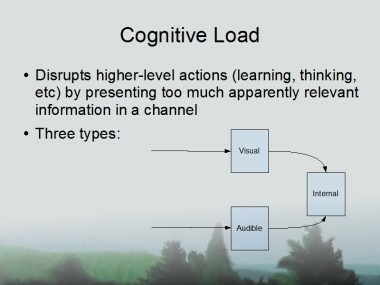 Instead, this research seeks cognitive load as an necessary part of instructional design. By establishing how wary student behavior is effected by cognitive load, this paper continues the work of uniting motivational and cognitive psychology (Sherman & Sherman, 1999) and, more importantly, allows students to do and learn more in educational settings. 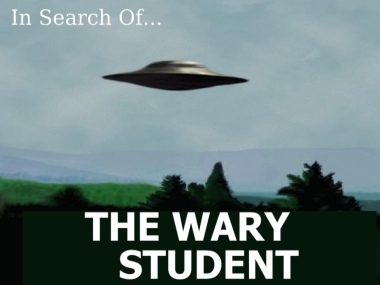 The wary student is a pro-social, cooperative individual driven by a distaste for unfairness as much as a desire for personal gain. He helps those who have unjust difficulty in completing work, though goes out of his way to cause trouble for cheaters who try to take advantage of others. 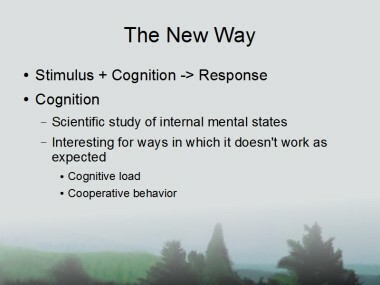 Cooperative Behavior is hypothesized to be an instinctual reaction to group life, while self-interested behavior is presumed to be the product of reflection and reationality. Therefore, this research will increase the subjects’ cognitive load in order to deter them from reflecting on their actions — the assumption is that this increased load will increase cooperative behavior. All research faces the “so what? question, and here the answer is obvious: cooperation is sometimes very good, sometimes very bad, but always very important in a classroom. 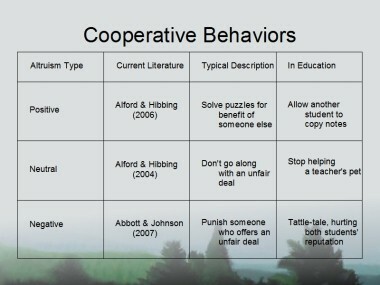 Cooperation means peer-on-peer tutoring, but it also means peer-on-peer cheating and peer-on-peer revenge. 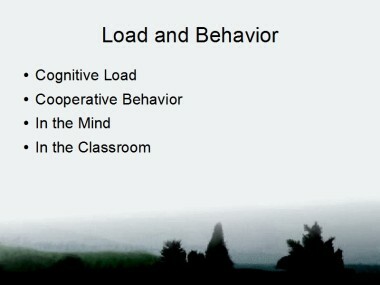 If manipulating cognitive load effects these actions, the ability to alter such load becomes an important tool for teachers. 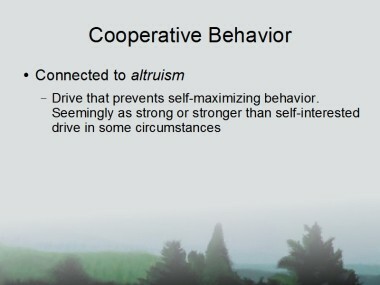 Alford & Hibbing noted that, as humans, â€œwe have an innate inclination to cooperate, particularly within defined group boundaries, but we are also highly sensitive to selfish actions on the part of other group membersâ€ (2004, 709). This is a foundation for the theory of wary cooperatives, people who often display â€œtwo, often competing desire: They want a reputation as a fair, desirable, possibly generous, but certainly not foolish person [but also] worry about members oft the group who would take advantage of others if given the chanceâ€ (Hibbing & Alford, 2004, 65) Wary cooperators are â€œinherently disposed to be group oriented, high sensitive to be taken advantage of, and willing to incur costs to punish others who are perceived as putting themselves above the groupâ€ (Smith, 2006, 1013). Related to the concept of the wary cooperator is the wary guerrilla. As outlined by The Wary Guerrilla, the wary guerrilla is a type of cooperator who accepts an absolute reduction in welfare to punish unjust partners. Wary Guerrillas would rather they end up worse than they began as long as the unfair person did not escape punishment. More information on the details of this experiment appear later in this paper. Redefining the Gap was published in 14 parts. It includes its original introduction and conclusion, as well as new prologue and results sections that are exclusive to electronic media. Redefining the Gap‘s literature review section covers geopolitics, early geopolitical theories, the Global South hypothesis, critical geopolitics, and Dr. Barnett’s PNM Theory. The report also includes a research design as well as a section on methods and operationalizations. The series concludes with an extensive bibliography, the computer logic used in the research, and the resulting scaled data. Redefining the Gap is part of tdaxp‘s SummerBlog ’06, a series of series that will continue as Dan reports from the People’s Republic of China. Future installments include an overview of constructivist teaching methods including an interview with noted historical and educator Mark Safranski, an exploration of variations of USAF Colonel John Boyd’s “OODA” Loop, and an analysis of the popular web-log Creative Anarchy from the perspective of Creativity, Talent, and Expertise. The tdaxp blog is available online at http://www.tdaxp.com. The tables you see above are the coefficients of correlations for the models described in this series to the measures Barnett describes. This study looked at the population of all states, not a sample of states, so the margin of error is +/-0%. These numbers are completely internally valid — they describe carefully derived measures. The difference between them is significant. However, the greater question of whether or not the correct measures were used is a different subject. Chirol from Coming Anarchy suggested that I look at the Four Flows instead of brutality, nastiness, etc. It may be that I misconstrued what Barnett meant in the passages of Pentagon’s New Map where he gives the definitions. Regardless of the meaning of these numbers, a short discussion of the results is included below. Brutality. This was the biggest surprise. For most measures, including Barnett’s Core-Gap and Old Core – New Core – Gap, brutality decreases in the Core. This is because the University of Maryland’s ICBP database that I used measures the countries involved in wars. Besides ignoring some sub-state conflicts, the project would this could the Kosovo War as mostly a “Core” war. After all, nearly all the combatants — America, England, etc, – are Core states. Still, the Afroislamic Gap is the best predictor of brutality. Afromuslim countries go to war more often than any other states. The worst predictor was the Old Core – New Core – Gap model. Nastiness. Measured through lack of political freedoms and human rights, Afromuslim states fail again. The worst measure is merely defining Lesser Developed Countries (LDCs) as the Gap. Poverty. Here, Barnett’s economic determinist model shines through. The very best measure is Old Core – New Core – Gap, and the second best is a more general Core – Gap. Interestingly, here the Afroislam model scored the worst — a reversal of our experience with Brutality — though here at least, both show a positive correlation between being in a “Gap” and general badness. Solitude. I modified Barnett’s measure, from internet hosts in a country to internet hosts per capita. It would make little sense to call a very populous state the most connected state if only a small fraction of its population had access to the internet. The results here are the similar to the ones for poverty — Old Core – New Core – Gap the best gauge, Afroislam the worst. Interestingly, here a 1st, 2nd, and 3rd world model of the globe does better than Barnett’s simpler Core-Gap model. Shortness. Want to die early? Move to an African or Islamic country. Only looking at the world from t he point of view of Developed — Lesser Developed — Least Developed states comes close to this. The very worst predictor is Barnett’s Core – Gap model, though Barnett’s Old Core – New Core – Gap model is only slightly better. All in All. Averaging these scores together, the AfroIslam model remains the best for describing the Hobbesian states we fight against and for. All in all, however, the ups in one Hobbesian measure seam to compensate for the downs in others, making all of these pretty good. Still, this shows a danger of just looking at an agregate measure instead of more specific measures. A Note on the Result. I’m not a statistician. I have advanced training in predicate calculus and relational algebra, but the pseudo-math of statistics is not my forte. I would much rather have my analysis short to pieces than for it to just sit here. Likewise, I used an extremely simple tool to run these numbers. Please, correct me. Show me where I am wrong. And then, let’s shrink the Gap — Afroislamic or not. Halford Mackinder said that â€œevery century has its own geographical perspective,â€ and it may even be true that â€œevery century has its own geographical stereotypeâ€ (Meinig 1956:553). Geopolitical analysis is necessarily limited to some conception of the world. This research design seeks to test a geopolitical view of the present world. It is not a test throughout time. It makes no claim to be. That makes this study no less valuable. The effects of this study depend on the truth or falsity of the hypothesis. In each case, the most interesting results would be if the hypothesis is false. A failure of the first hypothesis — that is, negative or no correlations for the binary Core-Gap value — is very unlikely. It is doubtful that life in in the “Core” is more brutal, nastier, shorter, poorer, and more solitary than life in the Gap. However, given the broad definition of “Core” here, negative or no correlation for at least some of the variables is possible. This raises a more delicate point: if just one of the categories has a negative correlation with the Core-Gap variable, there will be a temptation to simply say it was poorly defined. 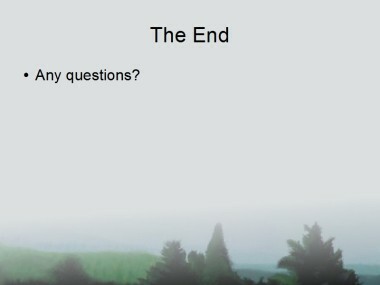 Regardless of the ultimate conclusion, though, such a result would pave the way to future research. In general, the same conclusions will hold true if hypothesis two is demonstrated false. However, a negative results here would be somewhat less surprising. If in general “new core” states are more livable than old core states, which seems somewhat reasonable (is “Old Core” Spain truly better than “New Core” South Korea? ), this would skew the results. Even if hypothesis one and two hold true, however, the utility of Barnett’s “new map” will be undermined if hypothesis three or four are shown to be negative. If for instance a geopolitical categorization based on the G77 or the Nonaligned movement are more accurate that Barnett’s concept, then PNM’s goal as a grand strategy for the United States is unlikely to be fulfilled. After all, why go with something new and strange when something old and familiar does the job better? Likewise, if defining the Gap simply as the Organization of the Islamic Conferences and the African Union gives better values than Barnett’s current summary, This is not just an academic concern, but may in turn effect base closings and even how and when to go to war. On the flip side, finding all five of the hypotheses true would help validate Barnett’s claims. More work would have to be done. After all, a study that uses the data suggested by the theorist might be suspect, but it would be a good first step. Poverty will be measured by GDP per capita, measured by purchasing power parity (CIA 2006c). Estimates are recent, with most being from 2004 or 2005. The information is listed in US Dollars. My study will scale GDP per capita so that poorest value is 0 and the richest value is 1. For each state, it’s value will be calculated by taking the difference between that state’s value and the lowest state’s value, divided by the difference between the highest state’s value and the lowest state’s value. The logic to read in and scale this data is included in the appendix, particularly in the function scaleData(). Nastiness will be measured by a state’s Freedom in the World measure (Freedom House 2006). Freedom House uses two 7-point scales for political freedoms and civil rights. The most repressive, and thus “nastiest,” regimes would score a 7 on both counts, while the least nasty would score 1. This study will take the mean of the two values and scale them, with the most free state having a score of “1” and the least free state having a score of “0.” The logic to read in and scale this data is included in the appendix. Shortness will be measured by life expectancy (CIA 2006d). Estimates are recent, with all dating from 2006. The information is listed in years. The study will scale life expectancy so that shortest value is â€œ0â€ and the longest value is â€œ1.â€ The logic to read in and scale this data is included in the appendix. Brutality will be calculated from the International Crisis Behavior project (CIDCM 2006). Wars which have been fought at least in part after 1992 will be considered. Wars are considered dyadic. Brutality will be measured as the sum of wars per year. For example, a state that is involved in two wars each against two states that each last two years would have a brutality score of “8.” The study will then scale the scores, with the least brutal state having a score of 0 and the most “brutal” state having a score of 1. The logic to read and scale this data is included in the appendix. Solitariness will be measured by the number of Internet hosts in a country per capita. This will be derived from two different measures: the number of Internet hosts per country divided by each country’s population (CIA 2006b; CIA 2006e). The population of Internet hosts and people are both estimated down to individual hosts and persons. All estimates of Internet hosts date form 2005 while all estimates of population date are for July 2006. The result will then be scaled, with the state with the highest number of Internet hosts per capita as “1,” and the state with the lowest number as “0.” The logic to read and scale this data is included in the appendix. The model will contain eight dependent variables, with two of them relating directly to Barnett’s “new map.” All will be ordinal values, with the lowest values referring to the Gap (or its supposed equivalent), and the highest values referring to the Functioning Core (or its supposed equivalent). Three of the variables will have two possible variables, while the other five will have three. The first dependent variables look at are Barnett’s models. Barnett has described his cartography in two different ways: as comprising a “Functioning Core” and a “Non-Integrating Gap,” as well as of comprising an “Old Core,” a “New Core,” and the “Gap.” The difference is that the more detailed model separates peripheral or newly developed economies — Argentina, South Africa, South Korea, etc. – from the Cold War pillars of North America, Western Europe, and Japan. The binary variable will rate the Gap as 0 and the Core as 1. The ternary variable will rate the Gap as 0, the New Core as 1, and the Old Core as 2. As Barnett’s PNM model is essentially a critical North-South view of the world, most of the other dependent variables for rival hypotheses will be taken from other concepts that are analogous to the Global South â€“ the Non-Aligned Movement and the Third World (Holm 1990:2). Additionally, one more will be added to address a cultural and race based criticism of Barnett’s map. The next four variables relate to an International Organizational definition of the global south. It relies on two NGOs, the G77 and the G24. The G77 is an organization of undeveloped countries, and the G24 is its executive steering committee. G77 nations are assumed to be similar to Barnett’s “Gap,” while G24 to his “New Core.” Therefore, the binary variable for this shall map the G77 to 0 and the rest of the world to 1. The ternary variable will rate nations only in the G77 as 0, states in the G77 and G24 as 1, and all other states as 2. Dependent variables for the Non-Aligned Movement and its executive steering committee, the G-15, will be calculated in the same fashion. The G77 and the Nonaligned Movement are of about the same age, though the G77 traditionally has a broader membership (Geldart and Lyon 1980-1981:80), so it makes sense to examine both of these alternatives. An “international group” perspective will be used to divide countries into Least Developed Nations, Less Developed Nations, and the rest of the world (CIAa 2006a). The measures of Least Developed Countries (LLDCs) and Less Developed Countries (LDCs) originate at the United Nations. The distinction is meant to separate countries which have a reasonable chance of developing with those facing severe structural maladies (Horowitz 1985-1986:47).The same ternary and binary divisions will be used for these are as predicted. When viewed binarily, LLDc and LDCs will both be valued at 0, with other states valued at 1. Viewed as ternary, LLDCs will have the value of 0, LDCs of 1, and all other states of 2. The term Global South originated in part as a reaction against the fading “Third World” model that was born in the 1950s. This model will use this model, taking as its definition of “worlds” from a map. Formerly and currently Communist states, from Poland to Vietnam, are in the Second World and labeled “2.” The United States and other “free” states are in the First World and labeled 1. The rest of the world, which closely matches traditional views of the Global South, is measured at 3. One more possible dependent variable, this one binary, will calculated. This addresses the concern that the “new map” is essentially just an encirclement of Africa and majority Muslim states, with the rest of the “Gap” (the Caribbean, South-East Asia, etc) as more-or-less superfluous. An earlier version of Barnett’s work made this explicit, â€œwith only Central Asia, the Middle East, and Africa trapped on the outside, noses pressed to the glassâ€ (Barnett 2004:109). This variable will label as “0” any state in either the Organization of Islamic States or the African Union, and label all other states as 1. The often culturally destructive actions of newly independent African states (Beckstrom 1974:698) and their stagnating economies (Hentz 1997:32), as well as increasing instability through much of the Arab (Sayigh 1991:487) and Muslim (Menon 1995:154) world, argue that this alternative is a reasonable one. 1.The Core-Gap binary variable will have have a positive correlation to each of the individual variables. 2.The Old-Core-New-Core-Gap ternary variable will have a positive correlation to each of the independent variables. 3.The Core-Gap binary variable will have a higher correlation to each of the independent variables than any of the other binary dependent variables. 4.The Old-Core-New-Core-Gap ternary variable will have a higher correlation to each of the independent variables than any of the other ternary dependent variables. 5.The Old Core-New Core-Gap ternary variable will have a higher correlation to each of the independent variables than the Core-Gap binary variable. Yet in spite of the potential consequences of Barnett’s work, little has been done to test it. For instance, do the measures he gives for the â€œGapâ€ actually correlate with being in the Gap? Does another accepted model work better? This model predicts that Barnett’s more granular summary, divided into the Old Core, New Core, and Gap, is both positive for each of the measures he defines as well as superior to alternate ternary models of the Global South. Likewise, this model predicts that his simpler version, with a united Core and the Gap, is both positive for each of those measures as well as superior to alternate binary measures. Last, this paper predicts that the more granular version is superior on these same counts to the less granular one. This model will contain five independent variables, and a sixth which is a composite of the five. The five independent variables are the measures of poverty, nastiness, shortness, brutality, and solitariness previously described. All independent variables will come form Barnett’s first measurement of the Gap. All data for this study will come from the CIA’s World Factbook, Freedom House’s Freedom in the World study, or the University of Maryland’s International Crisis Behavior Project. The World Factbook has been used in academic studies down the decades (Evans 2003:1311; Lennox 1993:705; Partem 1983:8). Freedom House is a leader in measuring democratic rights in countries, and is a standard on which other measures are judged (Davenport and Armstrong 2004 541; Vanhanen 2000 251). The University of Maryland’s database is also a leading statistical resource, but of war instead of rights (Caprioli and Boyer 2001 504; Oneal and Bryan 1995 380).